Arrival at Paro Airport and after completing your Visa / Permit formalities you will be received by our Bhutan representative who will assist you in boarding your vehicle for transfer to Thimphu (2320Mts / 7656Fts, 65 Kms / 01½ to 02 Hrs), Thimphu is the capital town of Bhutan and the centre of government, religion and commerce, Thimphu is a unique city with unusual mixture of modern development alongside ancient traditions. Although not what one expects from a capital city, Thimphu is still a fitting and lively place. Home to civil servants, expatriates and monk body, Thimphu maintains a strong national character in its architectural style. On arrival in Thimphu, Check in to the hotel. Evening free at leisure. Overnight at Hotel. After breakfast drive to Wangdi (Wangdiphodrang) (1350Mts / 4430Fts, 70 Kms / 03 to 3½ Hrs One way). Wangdi is the last town on the highway before entering Central Bhutan. The drive is over Dochu La pass (3080Mts / 10102Fts) which is very scenic with fascinating view of mountains of Bhutan. Stopping briefly here to take in the view and admire the Chorten, Mani wall, and Prayer flags which decorate the highest point on the road. If skies are clear, the following peaks can be seen from this Pass (Left to Right): Mt. Masagang (7,158Mts / 23478Fts), Mt. Tsendagang (6,960Mts / 22829Fts), Mt. Terigang (7,060Mts / 23157Fts), Mt. Jejegangphugang (7,158Mts / 23478Fts), Mt. Kangphugang (7,170Mts / 23518Fts), Mt. Zongphugang (7,060Mts / 23157Fts), a table mountain that dominates the isolated region of Lunana - Finally Mt.Gangkar Puensum (7,497Mts / 24590Fts), the highest peak in Bhutan. 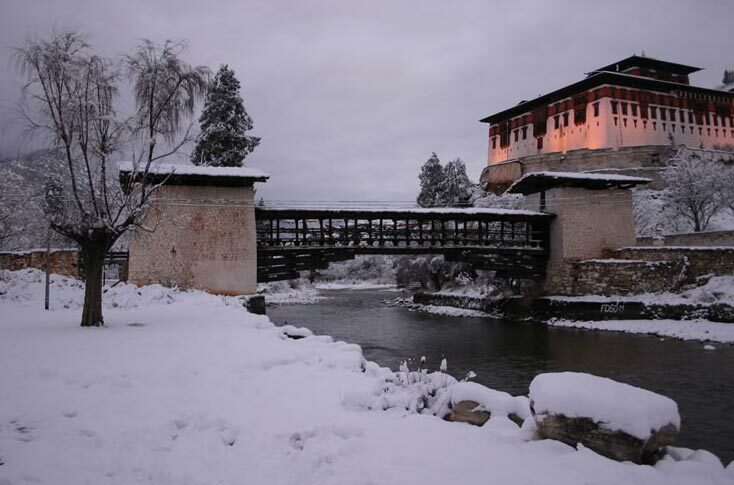 Punakha Dzong, Chimi Lhakhang (Monastery),Evening you drive back to Thimphu. Overnight at the Hotel. After breakfasts go for Thimphu sightseeing covering – Memorial Chorten, Tashichho Dzong, Buddha Point (Kuensel Phodong),Changangkha Lhakhang (Monastery), Motithang Takin Preservation Centre(presently closed for tourist), Drupthob Goemba / Zilukha Nunnery, National Library (Closed on Saturday , Sunday & National Holiday), Institute for Zorig Chusum (Traditional Art & Craft School-Closed on Saturday , Sunday, National Holiday & During Summer & Winter Vacations), Textiles Museum (Handicrafts Shops - Closed on Saturday, Sunday & National Holiday), Zangthopelri Lhakhang (Monastery). 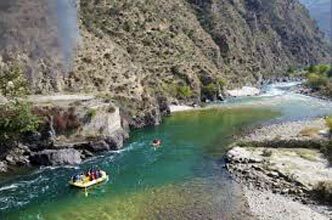 Later transfer to Paro (2200Mts / 7656Fts, 65 Kms / 01½ to 02 Hrs). On arrival Paro, check in to the hotel. Overnight at Hotel. After breakfast go for Paro Sightseeing covering Drukgyel Dzong (presently closed for tourist), Ta Dzong (National Museum-Closed on Saturday, Sunday & National Holiday), Rinpung Dzong, Kyichu Lhakhang (Monastery),Back to the hotel. Overnight at Hotel. OR PARO - FULL DAY HIKE TO TAKTSANG LHAKHANG (TIGER`S NEST) Start the day early for a day hike to Taktsang Lhakhang (Tigers Nest Monastery) - The hike which is all the way uphill takes about 2 /3 hours through pine forests. 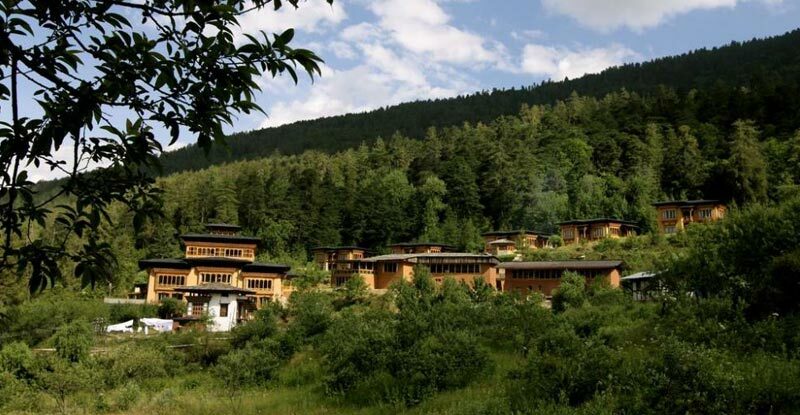 The monastery clings to a huge granite cliff 800 meters from the Paro valley. 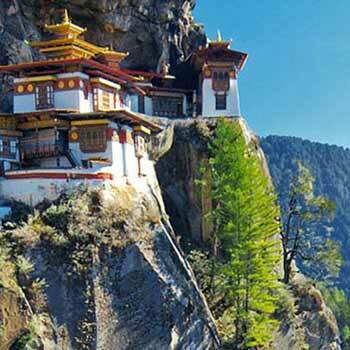 It is one of the most famous of Bhutans monasteries, perched on the side of a cliff 900m above the Paro valley floor. It is said that Guru Rinpoche arrived here on the back of a tigress and meditated at this monastery and hence it is called Tigers Nest. This site has been recognized as a most sacred place and visited by Shabdrung Ngawang Namgyal in 1646 and now visited by all Bhutanese at least once in their lifetime. On 19 April, 1998, a fire severely damaged the main structure of building but now this Bhutanese jewel has been restored to its original splendour. Afternoon at leisure for go for shopping in the market. Overnight at Hotel. After breakfast transfer to Paro Airport for taking onwards connection.